The Cercadillo Project - Lots of Good News! Home Uncategorized Lots of Good News! This picture of Mom was posted by Clark County Nursing Home and Residential Care. Mom has made remarkable progress recently! I just returned to the DR after visiting her for a week. Mom is now saying several words and occasionally even a phrase. 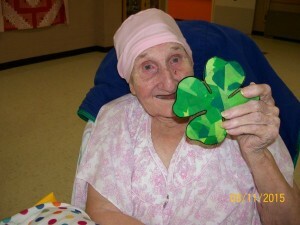 She is participating in various activities with the other residents. In some ways it is hard to imagine that I’m celebrating such things as a word or a phrase, or participation in a simple craft activity from one who was once so very independent and whose hands were so very productive. But our perspectives change as our lives change. I’ll long cherish the memories of this last week with her. Thank you to all who continue to pray for Mom. Your prayers are being answered. Thank you to all who visit her. And thank you to those who are caring for her on a daily basis. Just had my first six month check-up and everything looks good! I’ll have a whole body scan again in the summer, but for now there isn’t even anything remotely suspicious!!!! Kudos to the medical folks who have treated me here in the DR . . . my surgeon, Sylvia Batista and my ever-patient, ever-kind endocrinologist, Adalberto González. Hey, if you’re ever in need of a good team for thyroid cancer issues, you may want to consider coming on down to the DR! Mom looks great. Thankful all is well with your health. Always keeping you and The Cercadillo Project in prayer.